Pretty catchy title, huh? I came up with that one all by myself. I also fed myself, dressed myself, and I even wiped myself and put on my big boy pants all by myself. It might be a generic title and one I normally try to avoid, but in this case I think it actually works. Your favorite drinking establishment was no doubt filled with New Year’s Resolutions last night, but you can probably count on one hand the number of people who really plan on fulfilling it. It's like the old head in the toilet prayer, “Please God if I can survive this night I promise I will quit drinking forever," partaken by many a partier last night. Like most unfulfilled resolutions, it doesn’t matter if these can, will, or even should happen for the Phillies. But if the circumstances allow, here are a few things the Phils should resolve to accomplish by this time next year. In our regular feature on Phils Baseball, here are the rumors from the past week from the guys at MLB Trade Rumors. They have a page devoted just to Phillies rumors (this is not a paid plug, honest) and all we do is put everything from the past week in one post. I am a huge Chris Wheeler fan and I'm not afraid to admit it. There, I said it. If you were to base Chris Wheeler's popularity simply on radio callers and comments on websites, I am clearly in the minority here. As Pat Gallen pointed out on Phillies Nation, "Wheeler caught quite a bit of crap from the average fan." I’m not going to go through the whole list of grievances here – you know your reasons. As one writer described, "My father hated Wheels. There's a good chance your father hated Wheels. If not your father, then your uncle, or your mom or your older brother. So...you probably came to hate Wheels too." Broadcasters, particularly in baseball, are a very personal thing to most people. It's also very subjective, which is why I won't try to change your minds (trust me, I've tried and it doesn't work). But I do hope you can appreciate his work in the booth for nearly four decades. I almost laughed out loud when I read the title: Morandini may be next Phillies broadcaster. Seriously? The guy whose voice sounded like a mix between Shaggy and the guy from the Men’s Warehouse commercials? Maybe it wasn’t that bad, but that is how my little kid memory recalls it. Anyhow, that was my mind set when I read Bob Brookover’s piece which mentioned Mi-ck-ey Mor-an-dini as a potential color commentator for the Phils. Now I think I’m sold. My opinion already had begun swaying after reading his interview on Phillies Nation about his new coaching job at AAA. Unlike the scripted and intentionally boring, non-committal answers Chase Utley provided us in his awkward publicity tour last week, Mickey Morandini was refreshingly honest. Remember Ryan Madson in 2008? How nice it was to have confidence entering the 8th inning with a lead? Remember how important he was in the 2008 postseason with a 2.13 ERA? Ruben Amaro certainly remembered. When he brought in Mike Adams last season for 2 years/$12 million, he hoped he added the pitcher who compiled a 1.98 ERA in 297 games with the Padres and Rangers from 2008-11. What Amaro did not want was a repeat of the bullpen's 4.89 eighth inning ERA in 2012 – remember, the good old days of Chad Qualls? Mike Adams was supposed to change that. Of course, with Adams limited to just 25 innings due to injury, 2013 ended up being that repeat performance. 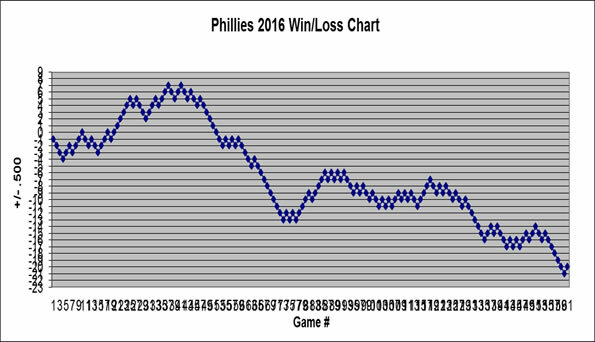 The Phillies 8th inning ERA last season improved negligibly to 4.33 and from 2nd worst in baseball to 4th worst. What if the Phillies had the 2011 Mike Adams last season? In 2011, he pitched to an obscene 0.99 eighth inning ERA in 63.2 innings. Obviously it would be a huge stretch to assume he could repeat those numbers after an offseason surgery and considering his overall ERA went from 1.47 in 2011 to 3.27 in 2012, but let's see what would happen if he had.